Bild: stalactite and stalagmiet nearly grown together. It will take only a few more centuries to form a pillar. Bärenhöhle in Deutschand. Bild: A large pillar in the Postojnska Jama in Slovenien. Pillars are a stalactite and a stalagmite grown together. Stalactites form, where calzite rich water enters the cave at the ceiling. When the drop grows and falls down, it will again deposit some limestone at the floor and forms a stalagmite. So it is very common, that stalactites and stalagmites grown at the same time. They grow against each other. It is rather common that stalactites and stalagmites meet and join. But as they grow very slowly it takes hundred thousands of years. After they met they are called a pillar or column. 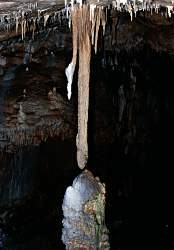 Sometimes the term stalagnate is used, but it is not common any more. Pilars are not really a different speleothem, but they are the late stage of stalactites and stalagmites. And the two dripstones grow now from water which runs down on the outside, without dripping. After some time the pillar looses the typical shape with a thick lower part and a thin upper part, and becomes a more or less cylindrical column. The former stalagmite and stalactite are not identifiable any more. There are numerous shapes of such pillars, as there are numerous shapes of stalactites and stalagmites. Most common are the ones looking like on the image to the right: Upper end thin, lower end thick and a little bit like a pyramid, getting thinner step by step. 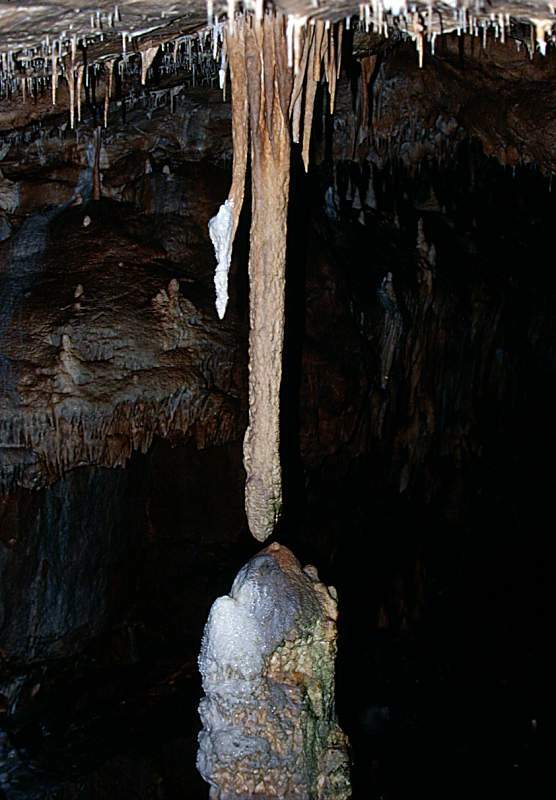 It is rare but possible, that stalactite and stalagmite are not formed at the same time. This is e.g. when the floor is covered by a cave river in river caves. 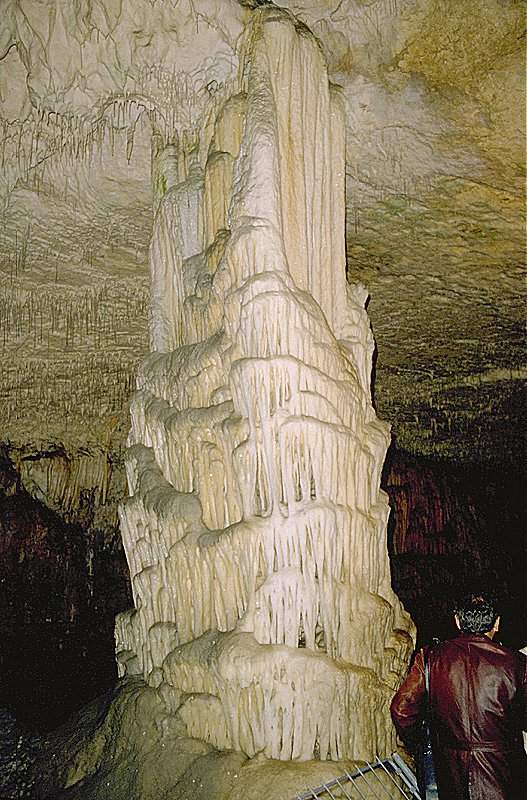 The water hinders the growth of the stalagmite. But if the stalagmite becomes long enough to reach the floor it will still form a pillar.